While I love travelling, sometimes figuring out the best place to go to reignite my passion and satisfy my fashion cravings can be difficult. After all, we literally have the whole world to wade through! Taking style as my guide, I’ve put together a list of six fashion-forward cities that are travel musts for 2017. These six hot destinations offer some of the most beautiful, artistic, and fashionable places on the globe—I’ve already booked my tickets! 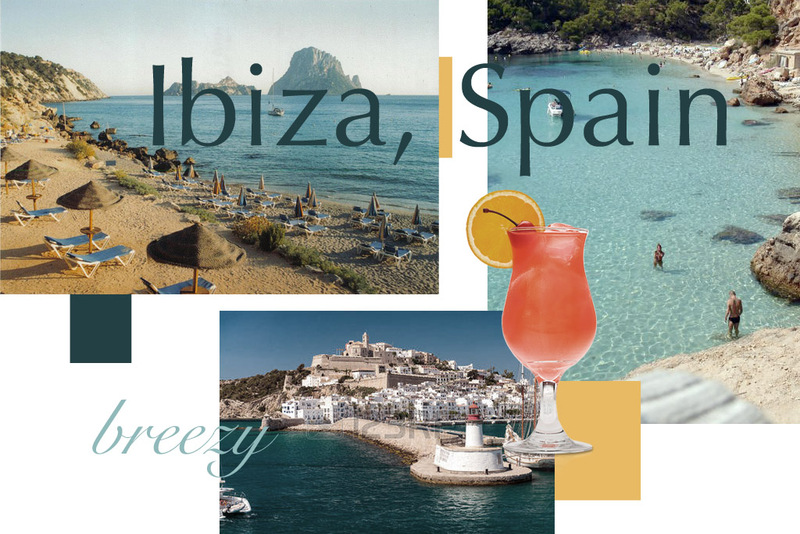 Those who’ve heard Mike Posner’s hit single, “I Took a Pill in Ibiza” know that things can get wild at this gorgeous tourist attraction and party city. While Ibiza is well deserving of this reputation, there is far more to do in this historic town than simply drink and dance. Popular among beautiful people from the world over, this island city is known for its breezy bohemian fashion in addition to being a world heritage site featuring architecture that dates back as early as the 7th century BC. Sip at a classic Mai Tai and browse the shops—don’t miss Charo Ruiz, Ibiza’s most famous fashion brand—to discover the perfect boho chic ensemble for a night partying under the stars. Plus, the Ibiza Fashion Festival returns this June 9-11! Even if you aren’t the “big city” type, Tokyo’s many districts offer a smaller community feel in the midst of this sprawling metropolis. As one of the largest metropolitan regions in the world, Tokyo’s diverse neighborhoods are a dream for any fashion diva! Take in Harajuku street fashion, enjoy a martini at one of the jazz clubs near Tokyo Tower, visit the upscale shopping district of Odaiba, or have a ball at Shibuya’s entertainment district. Chances are that you’ll find plenty of inspiration and more than one on-trend piece to add to your wardrobe while visiting this magnificent city, famous for its street fashion! The biggest celebration of Japanese style is Amazon Fashion Week Tokyo, coming up this October and featuring the latest in Tokyo street style and top Japanese designers! One of the more fabulous effects of the U.S. improved relations with Cuba is that the breathtaking capitol of Havana is now open for all tourists to visit! 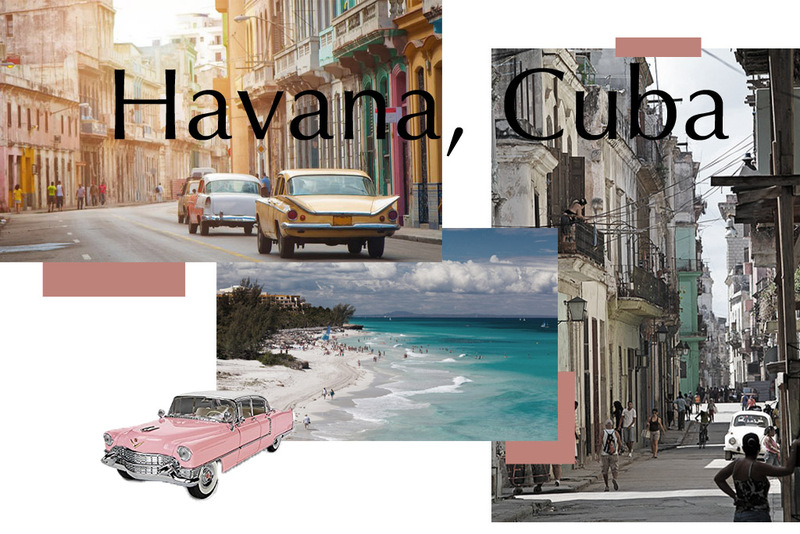 Stepping onto the streets of Havana feels like stepping back in time, with colorful buildings and vintage 1950s automobiles all around. The perfect environment for rocking a pin-up aesthetic, I love drinking a virgin-mojito and waiting for an impromptu street party to begin! For a day of romance and sightseeing, check out the architecture and history of Habana Vieja (Old Havana), with one of the area’s many walking tours. Or visit the Museum of Rum for a taste of the island’s most popular libation. Who knows, you just might stumble upon a clothing shop offering some killer vintage finds! To see and be seen in what is perhaps THE hottest travel destination this year, book your ticket for the 19th Habano Cigar Festival, running Feb. 27-March 3. Repopularized with the success of 2016’s La La Land, Hollywood remains as fresh and vibrant as ever. Whether you visit the sets of some of America’s most iconic films, enjoy a scenic hike above the cityscape (Runyon Canyon and Los Leones Trail are two of my frequent haunts), or enjoy a delish meal at one of the city’s posh restaurants (Gwen and Norah are hot right now! ), there’s truly something for everyone. I might be a little biased since I call L.A. home these days, but there’s no denying that it’s a trendy city when it comes to the fashion game. Don’t miss the luxe Rodeo Drive shopping district for VIP treatment from the top luxury brands, and stroll along Melrose Place for access to some of the chicest fashion houses—Marni, Isabel Marant, and Zimmerman among them! While you’re in West Hollywood, be sure to stop by my favorite little coffee shop, Alfred Coffee & Kitchen. After the sun sets, enjoy drinks at one of L.A.’s iconic music venues. Plus, the city’s fashion district is a wonderland of wholesale finds featuring the latest designs at manufacturer prices. You don’t have to be a movie star to feel like one amidst the glitz and glam of Hollywood! Established largely during the 1850s gold rush, Melbourne remains as vibrant as ever with an influential flair for fashion that is quickly catching on the world over. Make sure to check out the the hottest Australian brands this year, from Ellery to Dion Lee and Jac and Jack—shop them and other top Aussie designers at the Bourke Street Mall or High Street Armadale. Visit the majestic Block Arcade in Collins Street to see some of the most beautiful mosaic floors and 19th century architectural details the world has to offer. Fitzroy is also a must-see: an up-and-coming neighborhood known for street art, dive bars, and fabulous music venues. And, if you want to catch the largest consumer fashion festival in the world, grab tickets for this year’s Virgin Australia Melbourne Fashion Festival (VAMFF), which runs March 1-19, before they sell out! 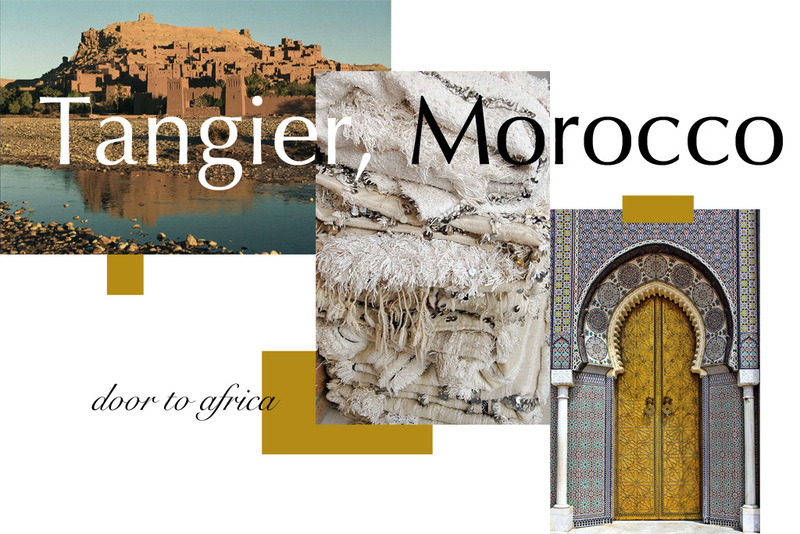 Known colloquially as the “door to Africa,” Tangier boasts a rich and complex history dating back millennia. Featuring posh beachfront resorts and mountain views, Tangier has all the beauty of the natural world, as well as some of our favorite urban luxuries. After spending a morning basking by the Mediterranean Sea, get in some amazing shopping and discover great deals on everything from custom-made handbags to ceramic tableware—the stunning Moroccan rugs are my favorite! Before you head home, you just might want to stop off in Marakesh for a visit to some of the top Moroccan designers, including Bakchic and Kaftan Queen! While I like to bring fashion with me wherever I go, there’s absolutely nothing better than building up my wardrobe from inspiration received while travelling abroad. By glimpsing all of the wonder that the world has to offer, we learn about new colors, fabrics, and styles that can help boost our fashion to a whole new level. Take your fashionista spirit with you as you enjoy the delights that these six destinations have to offer! Christmas is just around the corner and to celebrate, Bergdorf Goodman’s 2016 legendary window displays have been revealed. This year’s theme is called Destination Extraordinary and with not one but five exceptional window displays brimming with festive cheer, let’s take a closer look at the window design of one of New York’s most iconic department stores. Brimming with lush greenery, this year’s display is somewhat of a showstopper to say the least. For many, the unveiling of the Christmas window displays signifies the start of the festive season and whether you are a local or a tourist, the Bergdorf Goodman window is worthy of your attention. In New York City, elaborate decorations are all part and parcel of the Christmas countdown not forgetting a trip to the Rockefeller Center tree lighting ceremony. The Rockefeller Center tree lighting ceremony boasts a two-hour variety show featuring a sprinkling of celebrity performances and live music. Hundreds of people come out to watch the 92-foot tree light up (with over 50,000 lights for those interested). This luxurious light ceremony is exciting and extravagant and if you are in New York over the festive season, this is one event to mark down in your diary. If you aren’t in the city, you can watch the ceremony in all its glory on youtube somewhere. This year the theme for the Bergdorf Goodman’s holiday window displays is Destination Extraordinary. Inspired by the paintings of Henri Rousseau and visits to the American Museum of Natural History, the displays feature unique imaginary destinations including an opulent Winter Garden, Bird’s Eye View, The Hitch Hiker, The Scenic Route and The Book Club. The common theme between all of the displays is the colour green with lush leaves, beads and dried flowers adorning each scene. Each display features a mannequin dressed to the nines. Gucci, Marc Jacobs and Roberto Cavalli are just a few of the designer brands that take centre stage. Destination Extraordinary is the end result of six months of hard work and it truly is wow-worthy. With only a couple of weeks until Santa comes to town, there is no better time to explore the ultra-festive window displays that New York City has to offer. Swing by the festive window displays of the Bergdorf Goodman department store and be enchanted by its magic this Christmas. Fusing breath-taking skyscrapers, cosmopolitan scenes and luxury shopping, Abu Dhabi has an air of grandeur. Like many major cities around the world, this stunning location offers you an array of exquisite attractions, whether you’re searching for tranquillity, excitement, or elegance. If you’re planning your next escapade or have a layover, relish the opportunity to explore one of the most decadent places on earth and consider visiting these Abu Dhabi landmarks. The Sheikh Zayed Grand Mosque Center, adorned with marble, semi-precious stones and chandeliers could easily be the eighth wonder of the world. Holding space for 40,000 people, the mosque offers self-guided walks alongside free tours in both English and Arabic. The dress code is Arabic dress or you can loan an abaya on entrance. This magical experience is even more beautiful at night. For thrill-seekers, look no further than Yas Island. This exhilarating, adventure land promises attractions that you’ll find nowhere else in the city. Live concerts, formula 1 racing and the world’s largest waterpark are some of the key attractions to visit. Alternatively, head to a haven of serenity with a spa day or dine in one of the 90 restaurants. The stunning beaches and sensational hotels like the Yas Viceroy make the island an idyllic setting for a vacation. Located on Al Maryah Island, The Galleria is undoubtedly the home of luxury shopping in Abu Dhabi. Featuring the crème de la crème in designer fashion, brands like Balenciaga, Dior, Gucci, and Lanvin are just a handful of notable names occupying the mall. Grab a coffee at Magnolia Bakery as you explore the finest in retail, or partake in a dining experience at Rosewood or Cafe Milano located inside of the four Seasons Hotel next door. Art is a popular pastime in Dubai so the N2N Gallery is the perfect place to visit. Combining art collections from Abu Dhabi and Europe, the gallery showcases over 170 pieces from 13 artists. As well as viewing sculptures, contemporary art, and paintings, N2N also offers art classes, providing a pleasant opportunity for you to immerse yourself in the local art scene. And The Louvre Abu Dhabi, opening in 2017 is a universal museum in the Arab world. It’s intended to be a place of discovery, exchange and education. A regal, seven-star hotel, the Emirates Palace is set in 85 hectares of lush greenery and is the world’s most expensive hotel. Decorated in marble, silver, and gold with Swarovski crystal chandeliers, the 200 fountains, 114 domes and 2000 staff members make this hotel one of the grandest locations in the city. The world-class caviar bar (all though I don’t like caviar) serves a traditional caviar menu with champagne, set against a backdrop of live music, while each room boasts 24-hour butler service, iPad mini, and wi-fi of course. Experience fine dining at one of the 14 restaurants, or relax in the spa and swimming pool. The culture of Abu Dhabi is rooted in Arabic traditions. While nationals of UAE wear traditional dress, visitors are welcome to wear liberal clothing. However, any short or tight clothes may be deemed unwelcome so dress appropriately and respectful. Nico Rosberg’s Championship victory and final race at Abu Dhabi last week wasn’t the only thing that travelled 100+mph. With some time off pre-race, I visited the ‘Middle East’s Leading Tourist Attraction’ and no, it’s not the Burj. Nestled on Yas Island, just 30 minutes by car from the city centre, Ferrari World is the world’s first and only Ferrari branded amusement park. The park opened in 2010 and has quickly become a ‘must-visit’ for anyone travelling in the Middle East. The park is roughly the size of 7 football pitches and boasts not only the largest space frame structure ever built but also the world’s fastest roller coaster. The ‘Formula Rossa’ is the crowning jewel of the park with an exhilarating top (and world record holding) speed of 149 mph. If you’re after even more speed (as if a Formula 1 race wasn’t enough), Ferrari World has enough rides to satisfy all thrill seeking needs. If you want something a little slower, the park is surprisingly excellent for toddlers and teens with rides, shows and attractions to suit all ages and heights (be aware that height restrictions are strictly enforced so do some planning in advance to avoid waiting in a queue and being disappointed). • Galleria Ferrari – a Ferrari lover’s dreamland, this exhibition showcased a wide selection of classic and modern Ferraris. I can only describe it as somewhere between an art gallery, a motoring museum and a fashion show. • Tyre Change Show – this might not sound particularly glamorous but it was one of the highlights of my trip. This is an entertaining show with some Italian comics combined with a cpit stophance to try your hand at a F1 pit stop For the record, don’t wear heels when trying to change a formula 1 tyre! • Driving Experience – the highlight of the entire trip was a chance to get behind the wheel in a Ferrari California (in red of course) with a trained Ferrari driver. Family can sit in the back so you’re not on your own as you revel in the sheer beauty and opera of a 4.3 litre monster supercar. Overall, the park is one of the best theme parks I’ve ever been to and had enough to keep everyone entertained. Billed as ‘a train to fall in love with’, the world-famous Glacier Express takes passengers on the ultimate romantic journey through the Swiss Alps. The red-and-white train travels from east to west across a 300km stretch of railway, boasting unrivalled views of magnificent countryside en route. You can expect to see breathtaking mountain passes, glistening glaciers and rushing streams, so sit back, relax and enjoy the journey. The Glacier Express is over 75 years old, and took its very first trip in 1930 to ferry locals and tourists from one side of the Swiss Alps to the other. Up until 1982, the Glacier Express only ran during the summer months, as the thick winter snow made certain parts of the track impassable. In fact, there are still times during the year where conditions are too severe to travel. Today’s trains are powered by electricity, but the original steam-powered versions would have followed the same route. This magical 7.5-hour journey begins in the glamorous ski resorts of St Moritz, and snakes through the Albula Valley, Davos Dorf, the Nikolai Valley on its way to Zermatt and the Matterhorn village. You can jump aboard at stops along the way, and indeed catch it going in the opposite direction. Either way, there’s no shortage of stunning Alpine sights. Contrary to what ‘Express’ might suggest, this is the world’s slowest train − it travels at an average speed of just 20km/hour − but it would be a sin to rush past such dramatic landscapes, Alpine meadows, narrow valleys and deep gorges at speed. You’ll also conquer 91 tunnels and across 291 bridges in total if you travel the entire route. This is the most relaxing and elegant way to enjoy the picturesque landscape that makes Switzerland so utterly unique. Take a seat, pull out of the station, and you won’t be able to take your eyes off the unimpeded views through the windows of the stylish panoramic carriages. For example, the lengthy Rhaetian Railway (Rhätische Bahn RHB) section, which lies between Thusis and Bergün, is a World Heritage Site and an impressive demonstration of how civil engineering can blend seamlessly with its environment. It looks even better when the sky is blue, so it might be worth checking the weather before you book. Particular highlights along the 180-mile line include the one-hour ride between Disentis and Andermatt, the stunning six-arch 65m-high Landwasser Viaduct between Chur and Filisur, and the Oberalp Pass with its crystal-clear mountain lake. When you reach the Oberal Pass, you’ll be at the highest geographical point of the journey − it’s over 6,600 feet above sea level. Some of the climbs are so steep that drinks are served in specially designed tilted glass. 🙂 Well, you wouldn’t want your crisp Swiss white wine to spill, of course. This kind of attention to detail makes your trip even more of a pleasure. As well as indulging in a drink or two, you can also sample a freshly prepared three-course meal in the comfort of your seat or in the vintage dining carriage. This is luxury travel at its finest. Offering a truly unique perspective on the Swiss Alps, and a luxurious experience in total comfort, it’s no wonder the Glacier Express has gained iconic status. Make sure to bring your camera − you’ll want to look back at these fascinating sights forever. We have all seen the beautiful and magical pictures of Venice, but nothing can beat seeing its unique beauty in real life. The romantic and glimmering surroundings of Venice makes it a city like no other. Capital of northern Italy’s Veneto region, Venice is built on more than 100 small islands in a marshy lagoon in the Adriatic Sea. With no cars or roadways, Venice is enveloped with tranquil alley ways and shimmering canals. The Grand Canal winds through the city, often filled with small boats, water taxis and of course, Gondolas. The exquisite palaces and churches reflect centuries of history and a once wealthy trading center between Europe and the Orient. Exploring the narrow alleyways is a quintessential part of Venice, and it is one of the only few cities where getting lost may actually be a positive. Finding sweet Italian shops and iconic bridges is all part of the Venice experience. However, at some point you may find yourself in the Piazza San Marco, where tourists and locals congregate for a coffee or an aperitif. Listed as one of the most beautiful cities in the world to visit, the mesmerizing buildings and setting of Venice is something that can truly mesmerize people. As one of the most popular tourist destinations to visit, the charm and passion of the city can never be truly reflected in pictures. The Rialto bridge and Palazzo Ducale are simply unforgettable, and with every twist and turn you are met with a beautiful alley or tranquil canal. If you are not sea sick and have the time for a gondola trip, this can be one of the most beautiful and raw ways to see the streets of Venice. In 2008, the city was struck by catastrophic floods that left little in the city undamaged. As of today, the lagoon that has protected Venice from countless foreign invaders is the biggest threat to its survival. .. the city will eventually sink. Taking a water bus around Venice is an exciting and fun way of seeing Venice, and if you love to stay outdoors then a picnic by the Grand Canal is a great option. If you plan to wonder the maze of streets at night-time, make sure you take a stroll by the most beautiful church in Venice, St Mark’s Basilica. The marble pillars and towering breath-taking architecture is something you have to see! If you are expecting good weather, the best time to visit Venice is during late spring and early summer. However, bright sunshine can also be matched with heavy crowds and long waits to iconic land marks. Booking trips and finding accommodation can also be quite challenging, along with the rise in prices. During late summer, you can also expect Venice to be packed with tourist. Venice can become very hot and the canals can begin to give off a rather unpleasant odor, along with the bothersome mosquitoes. The fall can be a wonderful time of year to visit, as the crowds begin to diminish and the temperatures drop, which can make it a much more pleasant trip. However October through to January is usually considered a high water season, though flooding can occur at any time. Venice is a beautiful city and should be a must-see on your places to visit. Filled with beautiful buildings, winding canals and gondolas, Venice is a truly mesmerizing city. Perched on the edge of the cliffs on the eastern side of the Italian island of Capri sits the imposing red villa of Casa Malaparte (Malaparte House). Casa Malaparte is a three storey building. From the outside its most striking feature is the steeply sloping external staircase on one side that leads to the yellow coloured flat roof that covers most of the building. Inside, there is a Tyrolean wood stove, marble bathrooms in Pompeian style, an atrium that also evokes thoughts of ancient Roman civilisation and an impressive fireplace. The house is filled with examples of Signor Malaparte’s own writings and his extensive library of other books, and with much of his original furniture. Perhaps the most eye catching piece of architecture in the building is a chimney backed with heat-resistant glass, allowing any visitors to watch the flames of the furnace through the glass. The house also affords superb views of the Mediterranean Sea, the Sorrento peninsula, the Amalfi coast and the three gigantic rocks of the Faraglion. After the death of Signor Malaparte in 1957, the property fell into disrepair, before his great nephew Niccolo Rositani was instrumental in leading a restoration project. Since 1972 it has been owned by the Giorgio Ronchi Foundation, although the Malaparte family maintain it as a private home. You can visit the villa today, although public access to the interior is only permitted for a handful of special events each year. Its location also means that getting there is not easy. To reach the house today, you either need to walk for over an hour from the town of Capri, or arrive by boat and ascend the precarious staircase cut into the cliff. Many of the Capri island cruises pass close to the house, and it lies close to the Pizzolungo Trail walking route. If you can’t make the trip, try and track down the scene from Jean-Luc Godard’s 1963 film Contempt, where Brigitte Bardot sunbathes on Casa Malaparte’s flat roof. The great scone debate ‘jam or cream first?’ is not over for many Afternoon Tea Enthusiasts. Some prefer to spread the jam first (the traditional way), while others like to get started with the cream, like butter on toast. Well, here’s something we can all agree on – tea. Scones must be accompanied by tea. The great British tradition all started in 1840 when Anna, the 7th Duchess of Bedford got too hungry in-between lunch and dinner. Thanks to her, the tradition is still popular today but is more of a luxury treat than a daily routine. The world famous 5-star Ritz Hotel offers an unforgettable quintessential, British afternoon tea experience. Tea is served in the majestic Palm Court, conveniently located at Piccadilly. The beautiful detailed ceilings, birdcage chandeliers, metal flowers, mirrors and authentic monuments make the salon a must visit! The Ritz is known for its impressive personal care and attention to detail. You will be made to feel special without a doubt. If you like dressing up in fancy clothes you will fit in perfectly at this formal venue. 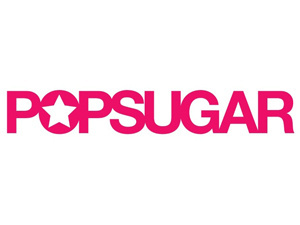 Expect to pay £50+ per person… Well worth the money! Delicately homemade finger sandwiches (smoked salmon are the best), apple and raisin scones and a selection of impeccably made cakes are served on pretty chinaware. Not only are there 18 different types of loose leaf tea to choose from but an Epicurean afternoon tea tasting experience is also on offer. To top off this luxurious experience, a pianist and harpist play modern and classical music in the Palm Court. Tea enthusiasts this is the place for you! Fortnum & Mason serve over 80 different types of rare, exotic tea from all over the world. They also offer their own traditional blends and have lately introduced a new range of green teas. F&M even have a tea-tasting service where staff members guide visitors through all the different blends and combinations. Exciting! Of course, they serve a great selection of sandwiches, scones and cakes too. The Diamond Jubilee Tea salon is where it all takes place and was not long ago opened in 2012 by the Queen! Visit for a relaxed and sophisticated afternoon of tea sipping. The view from the Shard is incredible, so along with afternoon tea you really are treating yourself. Booking a birthday surprise or celebration here would never fail to disappoint a close friend or relative! Over 30 different teas are offered and the option of English or Asian-inspired afternoon tea can be selected. Both choices are £54 or £62 with a glass of champagne. If you’re feeling adventurous and go with the Asian alternative, you must try the Ube Macarons and the Lemongrass Rice Pudding! Mayfair’s quirky Sketch gallery is a food, art and music hang out that does its own funky spin on afternoon tea. Not as traditional as The Ritz and The Royal Opera House, Sketch goes for a more contemporary menu (£45 pp). Mozzarella and pesto paninis are served in addition to classic salmon sandwiches, although, these can also be ordered if preferred. Visit Sketch for a colourful, vibrant afternoon tea and something a bit different to your average tea and scones. Now it’s time to choose the afternoon tea of your taste… If you are anything like me, you will want to visit them all! The capital of Portugal, Lisbon (Lisboa in the local language), is a great place to visit for lovers of art, fashion, food, architecture and sport. So, aside from its warm climate, why is it such a wonderful city? Lisbon is home to a number of world-class art galleries. Paintings by Rembrandt, Rubens, Monet, Van Dyck and Renoir are all on display at the Calouste Gulbenkian Museum; while works by Romney and Gainsborough form part of the superb private art collection at the Medeiros e Almeida Museum. The city also has a number of acclaimed contemporary galleries, such as the Museu Coleção Berardo (which has over 900 works) and the Centro de Arte Moderna. For something more quirky, why not visit the Coaches Museum, and see the magnificent vehicles in which Europe’s artisans travelled in years gone by. Lisbon is not one of Europe’s most expensive cities, so you may find that you can buy designer clothing relatively cheaply. The Avenida da Liberdade in the upmarket Chiado district is perhaps the nearest equivalent to London’s Bond Street. Here you can buy items by Dolce & Gabbana, Burberry Prorsum, Chanel, Gucci, Armani, Versace and Prada. When you’ve finished shopping, pay a visit to MUDE – the Design and Fashion Museum, which displays items from some 230 designers. The Chiado area of the city is home to Belcanto, where the skills of head chef José Avillez have been rewarded with a Michelin star. Eleven (also the recipient of a Michelin star), Largo, Tavares and 100 Maneiras all serve top quality Portugese and Mediterranean food; Doca Peixe is the go-to dining destination for seafood lovers; while superb French cuisine is on offer at Hotel Fortaleza do Guincho. If you want to sample Brazillian cuisine, then try Estrela da Bica. Lisbon has everything from the 16th century Jeronimos Monastery to the glass tower blocks of the modern Parque das Nacoes area. The Basílica da Estrela, the Igreja de São Domingos and the Mosteiro de São Vicente de Fora are also fine religious buildings. Many of the city’s railway stations are especially fine buildings, so if you find yourself catching a train from Gare do Oriente Station or Baixa-Chiado Metro Station, then allow extra time to look around. Guiding Architects offer bespoke English language tours of the city’s architectural gems. On July 10 2016, Portugal won the Euro 2016 football tournament. You can watch the newly crowned champions of Europe in home international matches on November 13 2016 and March 25, August 31 and October 10 2017, although it has not yet been confirmed whether all of these matches will be played in Lisbon. Cristiano Ronaldo, possibly the greatest player of the modern era, captains Portugal. Lisbon is home to two famous football clubs: Benfica and Sporting. These teams have regular home matches during the football season. Of the victorious Euro 2016 squad, Eliseu plays for Benfica; and Rui Patricio, William Carvalho, Adrien Silva and Joao Mário all play for Sporting.